Jabariya Jodi: Sidharth Malhotra, Parineeti Chopra starrer is scheduled to hit the silver screens in the month of July. As the film's shooting schedule got wrapped, makers celebrated it with a grand bash. Lead stars Parineeti Chopra and Sidharth Malhotra graced the event and were seen posing happily together. Take a look at the stunning actors and the inside photos of their party! Jabariya Jodi: Bollywood actors Parineeti Chopra and Sidharth Malhotra are coming back with their second collaboration together. In Vinil Mathew’s 2014 directorial Hasee Toh Phasee, the on-screen duo impressed fans with their chemistry and since then, fans have been waiting for their second movie together. With their outstanding performances, the couple appears quite promising for the next one too. 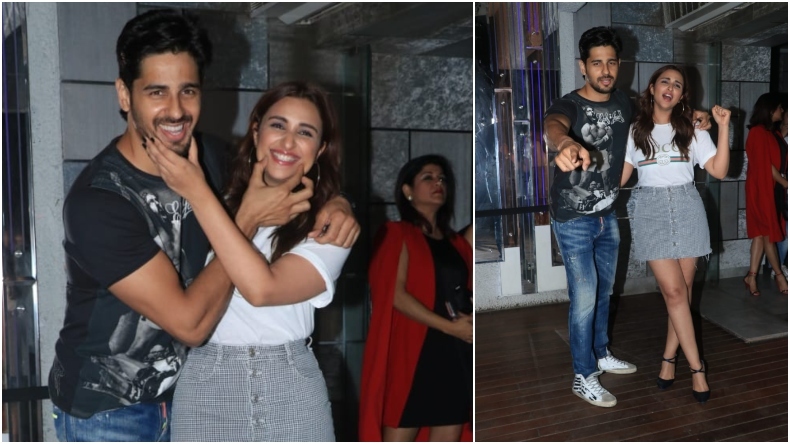 Gearing up for their next release Jabariya Jodi, Sidharth and Parineeti were seen enjoying the wrap-up party. As the film’s shooting schedule got wrapped, makers celebrated it with a grand bash. Lead stars Parineeti Chopra and Sidharth Malhotra graced the event and were seen posing happily together. Prashant Singh’s Jabariya Jodi is a film with a different storyline. Well, the makers celebrated the first successful step with a big party in Mumbai. Sidharth and Parineeti were captured playfully posing with each other. While Sidharth looked dapper in a black t-shirt, Parineeti Chopra donned a casual yet classy attire in a white Gucci t-shirt and grey and white buttoned mini skirt. Take a look at the stunning actors and the inside photos of their party! The grand party invited many guests and celebrities like Ekta Kapoor also graced the event. Photos of the Jabariya Jodi team posing together will leave you in smiles. @parineetichopra for her next movie completion bash in mumbai tonight! The movie revolves around an indifferent tradition of groom kidnapping, prevalent in Bihar. Reports say the Jabariya Jodi was first titled as Shotgun Shaadi. With a quirky storyline, the film has a lot to give including a refined starcast. Aparshakti Khurrana will also be seen playing a significant role in the movie. All set to hit the silver screens on July 12, the Parineeti Chopra and Sidharth Malhotra starrer will soon treat fans with its first look. Meanwhile, Sidharth will also be seen in Milap Zaveri’s action thriller Marjaavaan. Bankrolled by Bhushan Kumar, the movie will also star debutant Tara Sutaria, Ritesh Deshmukh and Rakul Preet Singh in pivotal roles.